John Russell, acoustic guitar; Maarten Altena, cello, double bass, voice on 26; Terry Day, percussion, voice on 24. Recorded on 24 March 1981 in London. 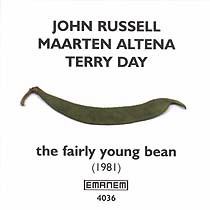 Runner bean on cover (reproduced above) by Marion Franses.